Our youngest daughter Patti will soon be 21. I still recall a hot summer day when she was 9. She was straightening her dresser drawers when she found a kit containing the makings for a Christmas ornament – and so began a pastime for Patti and an unexpected lesson for me. It took long hours for Patti to complete a delightful Santa’s head, with a red sequin hat, fuzzy beard and rosy cheeks. Occasionally when shopping, I’d purchase materials for her hobby and during the following months watch her patiently design and make her ornaments. When December was approaching it was fun to surprise Patti and buy an artificial tree, about four-feet tall, along with a small spotlight to shine on it. For several days before Christmas, she labored over her special endeavor and eagerly assembled and trimmed her tree. We displayed it slightly left of the living room fireplace and placed our nativity set on a snow-white cloth encircling her tree. Downstairs in the family room stood a full, bushy tree with the usual assortment of ornaments and tinsel. Underneath it se arranged the gifts for the family. During the holidays, family and friends gave courteous compliments to Patti’s tree and then settled in the family room around the larger tree. Christmas morning it was ignored as we all scrambled down the steps to open our gifts. Over the following years, Patti’s collection of handmade ornaments grew. 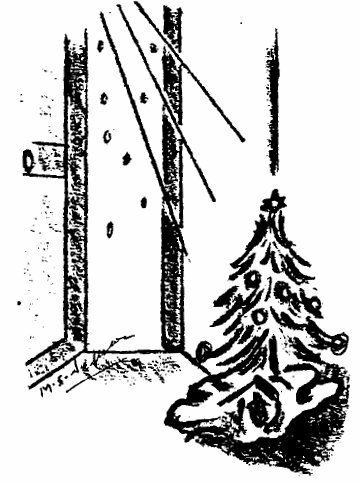 She made glitter balls, doves in flight, snowmen with charcoal noses and on, and on… Each year the tree shimmered in the clear beam of the concealed light. Each Christmas the larger tree drew the most attention because we didn’t really understand the determination and love that created Patti’s ornaments. As she grew older her interests changed and the tree lost its importance to her – and gradually was forgotten. Last fall my family was devastated to learn their dad had cancer. The emotional impact on us cannot be explained here. My husband entered the Cleveland Clinic and stayed a month. His radiation therapy began in November. By early December he was in constant pain and his mind focused inward, not realizing the holidays were approaching. On December 6th I entered the hospital for surgery and was released just prior to Christmas. Helplessly I explained to the family there would be no gifts, decorations or celebration on this holiday. Our older children stayed the night of Christmas Eve and each of us slept and dreamt of yesterdays we had taken for granted. At dawn, while snow fell lightly outside and my weary family was sleeping, I crept down the steps to the living room. There, just slightly left of the fireplace, stood Patti’s tree with the silent statues kneeling in the stable beneath it. That dawn, with the rays of the Christmas sun touching the tree and stable below, I realized the determination and healing powers of the human spirit. The infant in the manger, with outstretched arms, accepted what the future held for Him. I learned with acceptance the soul finds peace. For the first time I experienced a spiritual silence that truly was Christmas. No music, no rustle of wrapping paper, no excited voices, only a small tree created by a child’s precious heart. The ornaments reminded me how much we needed Patti’s tree. That day we greeted friends and relatives in the living room. The little tree was surrounded by love, the love Patti offered to us when she patiently made her decorations. Last year Patti’s tree was in the most prominent place in our home. It will never again be forgotten. Some nice stories here, Mary Jane. Thanks for posting them and for providing the link to me on my site.